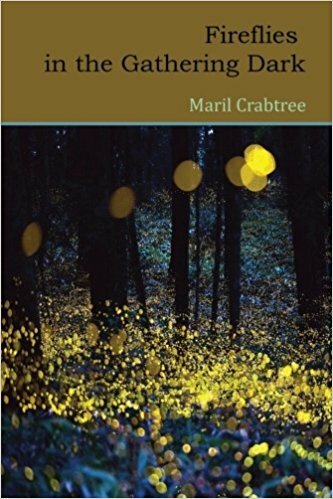 Congratulations to Maril Crabtree on the publication of her latest collection of poetry, “Fireflies in the Gathering Dark” with Kelsay Books. It is available for sale on Amazon. Maril is author of two poems in the 200 New Mexico Poems project: Driving to Dipping Springs and New Mexico Sky (which you can read by following the links). Maril Crabtree grew up in Memphis and New Orleans but calls the Midwest home. A former French teacher, lawyer, peace activist, environmentalist, energy healer, and yoga instructor, she is grateful for poetry—hers and others’—as the loom that weaves her life-threads together. Her most recent chapbook is Tying the Light (Finishing Line Press, 2014). She authored two previous chapbooks: Dancing with Elvis (Top Hat & Tails Press) and Moving On (Pudding House Press), and edited four anthologies of poetry and essays published by Adams Media. A Pushcart Prize nominee, her poetry has won numerous awards, including 1st Place “Judge’s Pick” in the anthology Well-Versed. Her work has appeared in numerous journals and anthologies including Kalliope, I-70 Review, The DMQ Review, Coal City Review, Main Street Rag, Persimmon Tree, Third Wednesday, and 2014 Poet’s Market. She previously served as poetry editor for Kansas City Voices and is a contributing editor for Heartland! Poems of Love, Resistance & Solidarity.